Home/Science of Sound/Sounds in the Sea/How does marine life affect ocean sound levels? The sounds produced by marine animals are many and varied. Marine mammals, such as blue whales and harbor porpoise, produce sounds over a wide frequency range, from less than 10 Hz to over 100,000 Hz, depending on the species of marine mammal. Many fish, such as the oyster toadfish and plainfin midshipman, and some marine invertebrates, such as snapping shrimp, also produce sounds. Examples of these marine animal sounds can be heard in the Audio Gallery. In some locations, at certain times of year, and in specific frequency bands, sounds produced by marine life can be the dominant source of underwater sound. Marine mammal calls, for example, can increase ambient noise levels by 20–25 dB in some locations at certain times of year. Blue and fin whales produce low-frequency sounds at frequencies of 10-40 Hz with estimated source levels of up to 190 underwater dB at 1 m. The following figure shows increases in ambient noise levels between 17 and 22 Hz off coastal California primarily because of blue and fin whale sounds. These blue and fin whale sounds are substantially louder than the noise produced by shipping traffic at this location and in this frequency band during the fall and winter months. Humpback whales produce songs at frequencies of 300 Hz – 10 kHz with estimated source levels of up to about 174 underwater dB at 1 m. (Fluke and flipper slaps produce even louder sounds, with source levels of up to about 192 underwater dB at 1 m.) Singing is most prevalent on the winter breeding grounds, such as those around the Hawaiian Islands, although songs have been recorded on the summer feeding grounds near Alaska and during migration between the winter and summer grounds. Singers are mostly lone, stationary males. When sounds are recorded at great distances from any single whale, however, one is likely to hear a number of whales singing, as in a chorus. Recordings made in a wide frequency band (up to 700 Hz) off Lahaina, Maui, in Hawaii, during the 1998 humpback whale winter season show a peak between mid-February and mid-March, when the population of humpback whales in Hawaii tends to peak. Ambient sound levels are nearly 15 dB higher during this time than in early January or late May because of humpback whale vocalizations. Aerial surveys showed a peak in whales sighted in this area on March 7, 1998, which is correlated with the highest sound levels recorded between January and MayAu, W. W. L., Mobley, J., Burgess, W. C., Lammers, M. O., & Nachtigall, P. E. (2000). 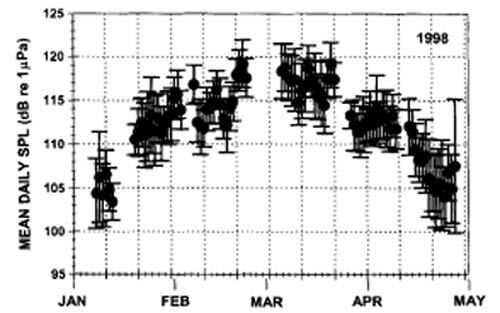 Seasonal and diurnal trends of chorusing humpback whales wintering in waters off western Maui. Marine Mammal Science, 16(3), 530–544. https://doi.org/10.1111/j.1748-7692.2000.tb00949.x. Daily means and standard deviations of sound levels off Lahaina, Maui, Hawaii, during the 1998 humpback whale winter season. [Reprinted with permission from Au, W. W. L., Mobley, J., Burgess, W. C., Lammers, M. O., and Nachtigall, P. E. 2000. “Seasonal and diurnal trends of chorusing humpback whales wintering in waters off western Maui,” Marine Mammal Science 16, 530–544. Copyright 2000, John Wiley and Sons). The humpback whale choruses were loudest at frequencies of 315 Hz and 630 Hz. The data also showed that night sound levels were louder than day sound levels. Snapping shrimp inhabit the seafloor of tropical and temperate waters at depths less than 60 m. They burrow into various substrates, including coral beds, the cavities of sponges, shell-filled mudflats, coral rubble, and rocks. Populations of snapping shrimp generate broadband sounds extending to 200 kHz with low-frequency spectral peaks at 2–5 kHz. Snapping shrimp have one enlarged claw, which produces a sharp, short signal when snapped closed. 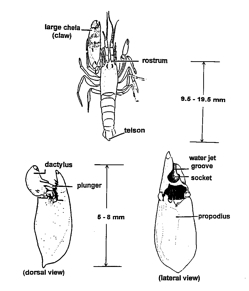 Individual snaps have peak-to-peak source levels of 183–189 underwater dB at 1 m.
Drawing of a snapping shrimp showing the top view of the whole shrimp and the dorsal and lateral views of the large claw. In the lateral view, part of the claw is removed to show the water jet groove that plays a critical role in sound production. (Adapted from Figure 1 from Knowlton and Moulton. 1963. Biol. Bull. 125:311-331. Reprinted with permission from the Marine Biological Laboratory, Woods Hole, MA. The sounds produced by snapping shrimp are the main contributors to the ambient sound fields in shallow bays, harbors, and inlets worldwide at latitudes less than about 40° north or south of the equator. During World War II, extensive measurements of the sounds produced by snapping shrimp were made along the southeast coast of the United States and in the central and south Pacific Ocean. Snapping shrimp sounds in Kaneohe Bay, Oahu, Hawaii, has been reported to be among the loudest anywhere, although recent measurements in Gladstone, Australia, indicate that snapping shrimp sounds may even exceed that in Kaneohe Bay. Ross, D. G. (1976). Mechanics of Underwater Noise. New York: Pergamon Press Inc.
Ross, D. G. (1993). On ocean underwater ambient noise. Acoustics Bulletin, 18(5).